This Marvel themed online slots game from Cryptologic is one very popular game. This 5-reel, 9 pay lines game is available at recommended online casinos such as Intercasino Casino where you get to play this awesome game for real money. The giant, green monster theme has always been a favorite amongst developers of online slot games and this game is a welcome addition to the bunch. The symbols keep in line with the theme ranging from nuclear symbols to a logo of the Incredible Hulk himself. The radiation logo acts as the scatter symbol in this game. This gives you wins on any reel it lands on. 3 or more radiation symbols will trigger the bonus game. The Incredible Hulk logo acts as the wild symbol for The Hulk game. This symbol can substitute for all other standard symbols except the scatter symbol. This symbol also acts as a multiplier for wins making them double. This symbol doubles your payout for any winning combination. When the player lands 3 or more radiation symbols, they trigger the bonus feature. The new screen with the bonus game shows a sky flooded with helicopters and the Hulk gets to choose items to throw at them. Hulk Smash! He can throw a car at the helicopter to win free spins. If you get hit, the life meter goes down. Smash long enough to enable you to get to the laboratory and smash some more. On the reels, the lowest jackpot starts at 1000 coins and goes to the highest jackpot which is 10,000 coins and includes 5 hulk symbols. The Hulk game has 3 progressive jackpots; The Hulk, Hero Jackpot, and Super Hero Jackpot. These are awarded randomly and are based purely on how lucky the player can get when playing this popular game online. The bigger the stakes, the better your chances of winning even more prizes. 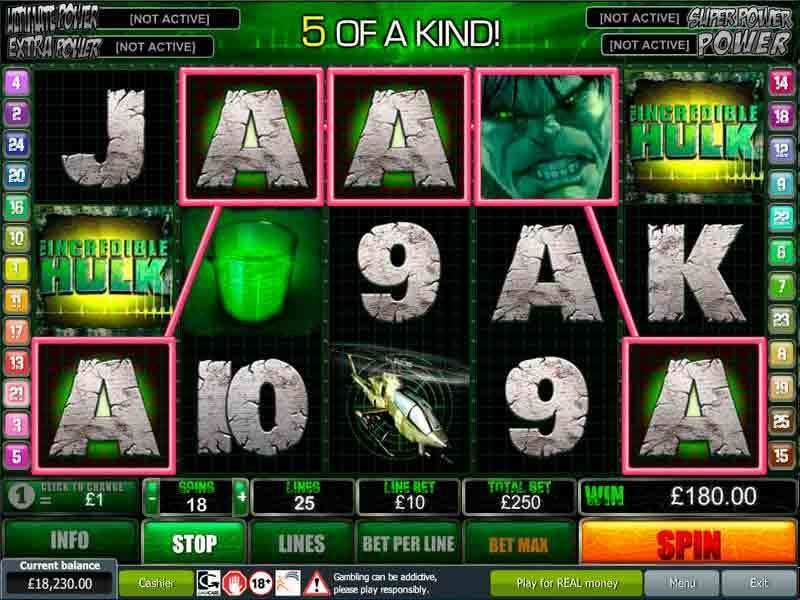 The Hulk 5-reels game is ideal for anyone looking to enjoy playing with the green monster. The bonus features and free spins are an added advantage to anyone looking to increase their winnings. The incredible hulk smashes his way up to the 10,000-coin jackpot and can award you with free spins and bonuses that get your winnings multiplied. The Hulk game is highly volatile which means getting rewards may not be often as you would like, but once you hit the jackpot, your winnings increase greatly. This game has some of the best graphics especially since it is from the Marvel franchise and the sound effects of the Hulk smashing and roaring make the gaming experience an even more exciting one. If you are a fan of the giant green monster themed game, you will definitely also enjoy playing the Halloween Slots Game which is also available online. For more games from Cryptographic software, visit any online casinos and play the free demo for practice as you prep to play for bigger stakes. 0 responses to "The Hulk 5-Reels Slot"